Evergreen, height 30cm, spread 40cm. 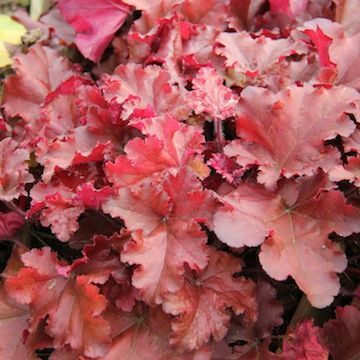 One of the Indian Summer series of premium Heucheras. This particular variety has beautiful mahogany red ruffled foliage and sprays of small white flowers late spring through to midsummer. The foliage is rounded and of neat habit. Can be grown in moisture retentive soil in shade or sun, but for best foliage colour grow in shade.